Definition: Gangrene is a condition that occurs when body tissue dies when a lack of blood supply in some part of the body, often the hands or feet. Symptoms may include a change in skin color to red or black, numbness, swelling, pain, skin breakdown, and coolness. The feet and hands are most commonly affected. Certain types may present with a fever or sepsis. Diabetes is linked to gangrene. Diabetes also affects the small arterial vessels and they become insufficient to supply the extremity. Other risk factors are smoking and conditions such as Raynaud’s disease. Gangrene can be classified as dry gangrene, wet gangrene, gas gangrene, internal gangrene, and necrotizing fasciitis. The diagnosis of gangrene is based on symptoms and supported by tests such as medical imaging. Treatment may involve surgery to remove the dead tissue, antibiotics to treat any infection, and efforts to address the underlying cause. Surgical efforts may include debridement, amputation, or the use of maggot therapy. Here are some key points about gangrene. Urgent treatment is important to prevent further serious illness and death. This includes the removal of dead tissue and sometimes amputation. Types of Gangrene: Gangrene is of two major types – Dry and wet gangrene. Dry gangrene – Dry gangrene occurs when there is slowing or obstruction in blood flow to parts of the body like toes and fingers. It is not a disease itself, but a symptom of other diseases. Dry gangrene is often due to peripheral artery disease but can be due to acute limb ischemia. It is the end result of chronic ischemia without infection. Dry gangrene is usually limited to the part affected and there is an area of healthy skin just beyond the affected area. The area involved turns cold, dry and black and eventually falls off. This is called mummification of the area. 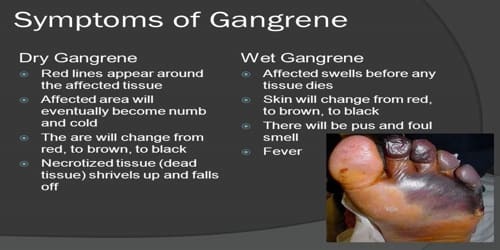 Wet gangrene – In wet or moist gangrene, the skin swells and blisters form and may rupture. Pus may appear. It is generally associated with infection of the dead tissue. Wet gangrene can develop following a severe burn or frostbite. This type of gangrene can occur in people with diabetes who have an injury but do not notice or attend to it due to diabetic neuropathy. Wet gangrene can spread much quicker leading to life-threatening complications like a septic shock if not treated immediately. Other Types – Gas gangrene, Internal gangrene, and Fournier’s gangrene. Causes, Sign, and Symptom of Gangrene: Gangrene is caused by a critically insufficient blood supply (e.g., peripheral vascular disease) or infection. It is associated with diabetes and long-term tobacco smoking. Blood plays a very important role in our health. Not only does it transport oxygen and nutrients throughout our body to feed cells, but it also delivers disease-fighting antibodies that protect our body from infection. Diagnosis and Treatment of Gangrene: A doctor will carry out a physical examination and take a medical history, to find out about symptoms and potential exposure to infection or trauma. They will look for signs of shock. Tests of blood, tissue, and any discharge may be carried out to identify any bacterial infection. Surgery may be necessary to explore the extent of the necrosis and to gain tissue samples. Antibiotics help slow the infection and clear small, unnoticed pockets of bacteria. A surgeon debrides (cuts away) the infected flesh and a margin around it to prevent further spread. If debridement isn’t enough, amputation is the next step. The patient is put in a hyperbaric chamber if one is available. This is a sealed metal tank pumped full of oxygen under high pressure. The pressure forces oxygen into the tissues, stopping the spread of anaerobic bacteria. Hyperbaric chambers were invented to help sea divers with the bends, but they have many uses in medicine. Antibiotics and surgery are commonly used as the principal treatments for gangrene and have been proven to be very effective. Hyperbaric chambers aren’t widely used because many hospitals don’t have access to them. 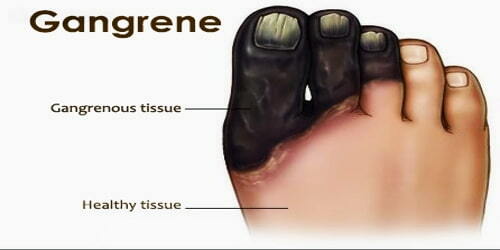 Gangrene, especially in diabetes, may be prevented by adequate foot care and good blood sugar control. A healthy diet, regular exercise, and stoppage of smoking may go a long way in prevention of gangrene.